The Marvel Universe is getting a brand new team, and we've got a brand new look at them in action in the trailer for Marvel Rising: Secret Warriors. The new trailer features several aspiring heroes coming together to save the world under the watchful eye of Captain Marvel. The team features quick besties to be Squirrel Girl and Ms. Marvel, as well as Quake, Patriot, America Chavez, and Inferno. Wait! Totally forgot Tippy, and Tippy gets quite peeved if you don't mention her. As you can see in the new trailer above, not everyone gets along as swimmingly as Squirrel Girl and Ms. Marvel, but they'll have to make it work if they want to get the job done, putting any personal feelings aside. If they can do that, then the enemy won't know what hit them. You can check out the brand new trailer in the video above and the new poster can be found there too. Marvel Rising: Secret Warriors stars Chloe Bennet (Quake), Milana Vayntrub (Squirrel Girl), Kathreen Khavari (Ms. Marvel), Kamil McFadden (Patriot), Tyler Posey (Inferno), BooBoo Stewart (Exile), Cierra Ramirez (America Chavez), Kim Raver (Captain Marvel), Ming-Na Wen (Hala), and Dee Bradley Baker (Tippy Toe/Lockjaw). Marvel Rising: Secret Warriors was executive produced by Joe Quesada, Dan Buckley, Cort Lane, and Eric Radomski; co-executive produced by Stan Lee, Sana Amanat, and Marsha Griffin. The film was written by Mairghread Scott. Alfred Gimeno served as supervising director. You can find the official description of Marvel Rising: Secret Warriors below. 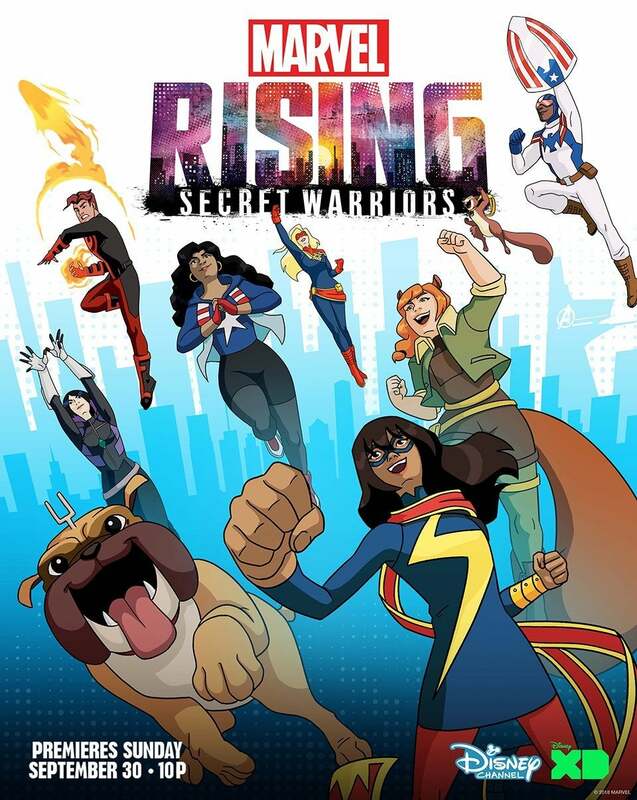 "In Marvel Rising: Secret Warriors, powered teens Ms. Marvel, Squirrel Girl, Quake, Patriot, America Chavez, and Inferno join forces as an unlikely, but formidable crew of aspiring heroes. When a threat no one could have expected bears down on the Marvel Universe, this ragtag, untrained band of teens have no choice but to rise together and prove to the world that sometimes the difference between a “hero” and “misfit” is just in the name." Marvel Rising: Secret Warriors lands on Disney Channel and Disney XD on Sunday, September 30th at 10:00 pm. What did you think of the new trailer? Let us know in the comments!